Shaktikanta Das takes charge amidst the clamour about intruding the autonomy of RBI and controversy regarding his educational qualification. Shaktikanta Das, the new governor of the Reserve Bank of India, the central bank, has his hands full. Besides tackling the challenge of addressing the health of the banking system, Das will also have to find a middle ground with the government over the issue of independence of the central bank. Former governor of the RBI, Urjit Patel. 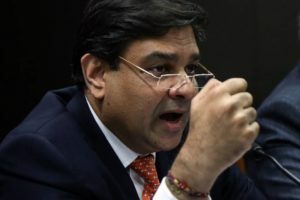 Before former governor Urjit Patel resigned, numerous disagreements had surfaced between the then governor and the government on the functioning of the RBI and its autonomy. The government was unhappy with Patel’s stance on adopting account standard based on International Financial Reporting Standard and stiff BASEL-III norms which could push the fragile Indian banks into deeper troubles. Another dispute was on transfer of a chunk of RBI’s reserves, which have swollen to INR 96 trillion (Eur 1.2 trillion). The government was also not pleased with RBI’s directive seeking mandatory insolvency for the debt servicing default beyond 180 days as well as the RBI’s stance on maintaining relatively higher levels of capital adequacy ratio. As one of his first engagements Das is meeting bosses of all public sector banks, which account for 70 pc of total banking assets of the country, about tackling the issue of bad loans that have crippled many of these banks in India. The total bad loans or NPAs (Non-performing Assets) with public sector banks stand at 8.97 trillion. In the meeting of the governing board of the RBI, slated for Friday, Das will also have to tackle the question of independence of the RBI. This will be the first meeting of the board since Patel’s resignation that followed days after a particularly stormy meeting. Bridging the disconnect between government and the RBI is now in the new governor’s hand.